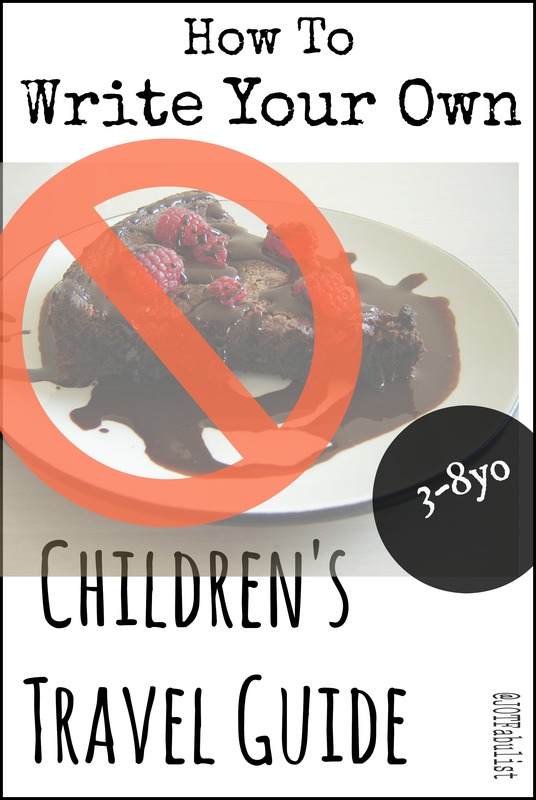 There are four ways to use books to prepare children for travel, but some involve more cake than others. One hundred percent pure knowledge. Due to the tendency of these books to be dry and dull, over-reliance on them may lead to suboptimal leaning and an excess of cake bribes (with subsequent hyperactivity and sugar-crashes). Some fantastic stories require little to no cake at all. More fantastic stories need less cake, but contain more, well, fantasy. Children may be disappointed when the holiday does not transform them into an adorable forest creature or involve saving anyone using super powers. Useful details may be edged out by said narratives involving forest creatures and super powers. Less fantastic stories require more cake, and tend to focus on the sightseeing exploits of a fictional child, which is probably the least of what children need to pick up from a book and in any case may not fit your itinerary. You’ll learn more about civil engineering, space programs, or natural disaster preparedness in your country of destination than you ever expected. May result in an unbalanced knowledge of destination/holiday photo collection. 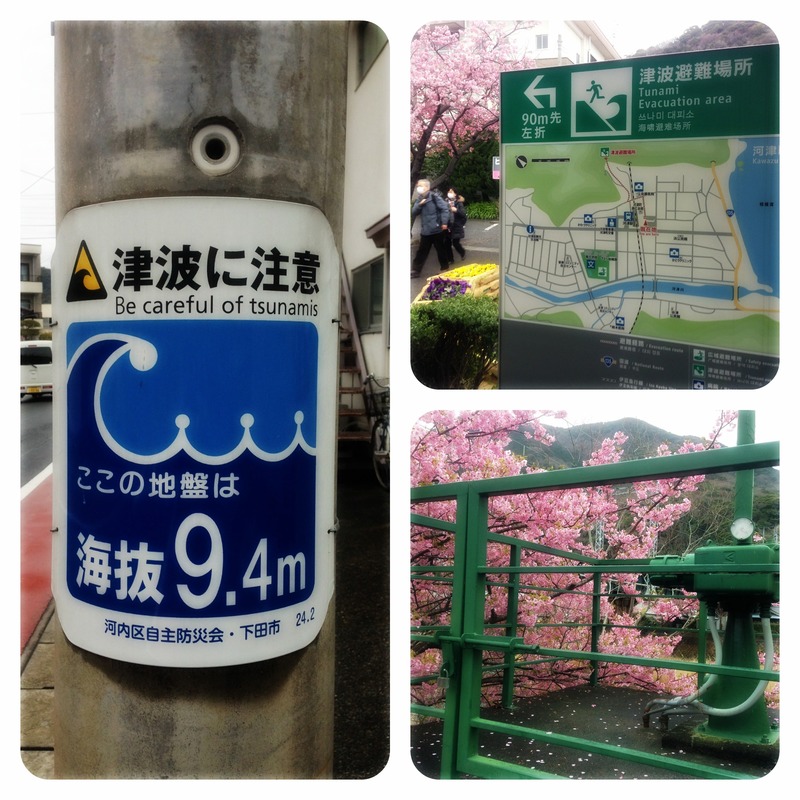 Our holiday photos from Japan were relatively light on the ancient temples and heavy on the tsunami warning systems. Messages and content can be directly targeted to suit your family and your itinerary. Writing is fun! Product is a children’s guide book, story, and activity book in one. You can keep the cake; eat it yourself. You have to find the time. To make that bit easier, I’ve written a plug-and-play formula for creating a customised, collaborative picture book itinerary for any holiday with a three-to-eight-year-old. Feel free to copy, tweak, add your favourite cake recipe, etc. Some sort of system for getting things written up onto paper (computer, printer, pen, etc). A whacky main character who for some reason can travel anywhere at a moment’s notice. I use an independently-wealthy expat alien from a planet far, far away, who resides on an “ordinary” street on Planet Earth for reasons nobody ever seems to care about. An unexpected visitor. My main character is Wiggy, whose alien friends are in the habit of asking him to show them around when they come to Earth for a holiday. They are all uniformly ignorant of Earth’s geography, and kind of assume that any given sight is more or less just around the corner from where Wiggy lives. A neighbouring human (or humans) the same age as your child(ren). The neighbour’s pen pal, in the target country. I use google to pick their name from the top ten list of baby names for the year of their birth. Alien gets letter from alien friend. Alien asks neighbour for Earth insight. Neighbour knows everything on account of having a pen pal in just the right part of the world, and a grand adventure for all is arranged. The characters set off from Wiggy’s house, via a route which is alway curiously identical to the one we intend to take. They took a taxi to the airport, where they boarded a big plane. The characters arrive at their first destination, which is briefly described in one or two sentences. They greet their local pen-pal guides in the local language. Tokyo was a big, modern city full of people rugged up for the winter. “Konnichiwa!” said Takiko, when they came through the arrivals gate at the airport. By an enormous coincidence, the characters are always planning to start their holiday in exactly the same way we are. They stop for a meal and choose from a local menu. One of the visitors makes a faux pas, and his friends gently correct it. The visitors express themselves using the words “sorry” and “thank you” in the local language. They all go to sleep. She helped them buy train tickets. “Arigato!” said Sam. Nimble-fizz tried to say thankyou by shaking his mouth tentacles, but Wiggy showed him how to bow instead. Each page details a new part of the itinerary. I use less detail for days the kids will take to easily. On these days, the kids don’t need help and they certainly don’t need spoilers. I’ll write a short sentence, and leave lots of blank space so they can record their own impressions as they make their own discoveries. The next day, they went on a walk through the mountains. Here’s what Wiggy saw. The characters end their holiday and go home. “There’s nothing like your own bed,” said Nimble-Fizz. 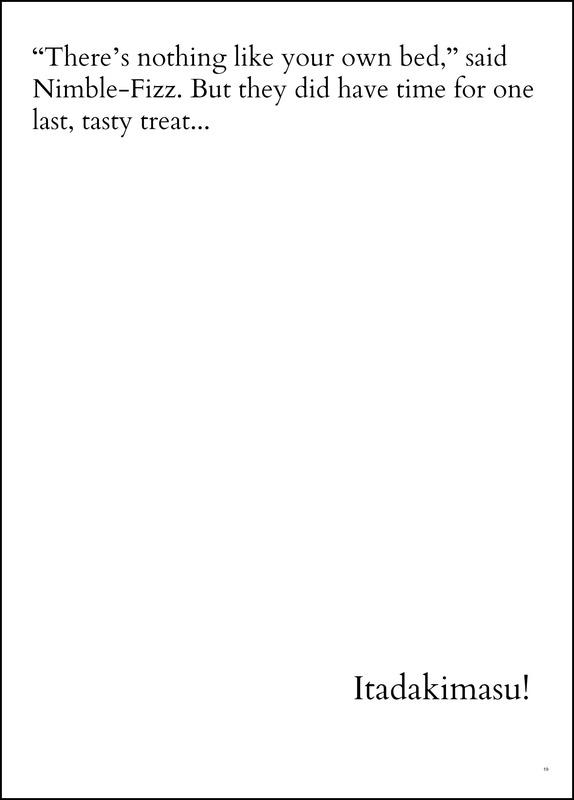 But they did have time for one last, tasty treat… Itadakimasu! I have a lot more tips on travelling with young kids. Some of them are especially helpful for sensitive or difficult travellers. I also have two posts on how to get rid of adult guide books when you don’t use them any more, but these are only very tangentially related, except inside my own head. This is a great plan. I have one son with autism spectrum and used to write him stories and show photos to show him what would be happening when, then didn’t really do that for my other kids and it would have actually worked really well for them. Ah, yes – I imagine you’d need to pull out all the forms of communication for him! Interesting to hear how it can help. I suspect there’s more techniques for special needs kids which can also help the rest of us (it’s just we don’t tend to need them). This is just a wonderful project of yours, Bronwyn Joy! What can we do to support you? Thanks for the offer! Nothing as yet except use with any picture-book-aged kids you might be in charge of (A is a bit above this age, I know) and/or share with anyone who might use it. Wow, I think I may try this on my husband! Hehe. Is your husband into friendly aliens or would he prefer something more tense and action-packed? That’s the question! Awesome idea. And after the trip the kids’ can write their own! Would love to see the guides you’ve created. Do you know, after this post it was pointed out to me that you could do them up as part of those print-on-demand photo books. You just have to photograph or scan the pages of your completed guide, maybe embellish a bit with a few extra photos, and put your order in. Kicking myself I haven’t done this before! Every now and then someone will ask me about traveling with child(ren) in tow; I always refer them to your blog. May have to keep this puppy onhand for just that circumstance. Thanks so much for your referrals! Means a lot coming from a blogger like you as well. Yes, this might a good page to start with, especially if they are the type who enjoy writing, as I suspect many of your readers do! Absolutely fantastic, but then your posts always are. 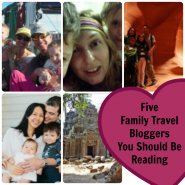 I bet you could publish some of your travel books for kids. I have made books in the past to increase 5yos interest in learning how to read, more recently we also made books from their day journals of their summer holidays … this sounds like even more fun and a great way to prepare them for travel. How did you use books to increase interest in reading? Not that we have too much trouble getting our boy to read, but you can’t set the bar too high there, can you? You are a virtual plethora of ideas Bronwyn. Shew! the imagination – amazing. Love the stories and the idea and the characters and the cake – yum! This stuff sure appears marketable to me. You should have someone who knows childrens’ markets check it out. There are a lot of ways you could monetize it – do one for each major tourist city perhaps with cut outs; do one for each country including sections on each major tourist attraction; they could be marketed through travel agencies as crafts to keep kids interested and engaged while travelling; There’s oodles of ideas you you could explore with this framework. Anyway, I vote for CAKE! Yum! Great Post Bronwyn – even though my family is grown, the post was fascinating to read. Wow – you’re really running with the idea there. Cutouts and everything! (I’m totally stealing that for the next one and yes, it does make it more flexible.) Feel free to keep talking… obviously I’m not seeing the full potential…! I won’t say they don’t either. No comment either way! What a fantastic idea 🙂 We’re putting your suggestions to work and having our two oldest write a Roman travel story for our youngest. We’re eager to see where this goes! Ooh! I’d love to hear how it turns out. I hadn’t even thought of the idea where it could be used to get siblings helping each other out, but that’s an added bonus. And of course having a simple formula and pre-set itinerary makes it perfectly within reach of junior story tellers! I bet a lot of kids would really have fun playing with the formula, too, adding their own touches. We still use ways one to three, and the fiction stories are gaining weight with P as he gets older and can think in more abstract terms (earlier it was non-fiction all the way). It’s good to capture the imagination. It’s definitely fun! But it’s also difficult to weave relevant facts and useful instructions into fictional stories without making them seriously not-fun-anymore. There are books that do it well, but most of the time when you’re searching the library you either get a really engaging story that’s not much use as anything except a story, or a technically-fictional story with useful facts but it’s not much more fun than a non-fiction book. I’ll put it on the back burner 🙂 In the meantime – thanks for the compliments! Wiggy sounds great!! Wish I had been that creative and organised before a trip, we all might have had an easier time on the journey. We did take route 3 a few times, it backfired and we ended up with freaked out child in various places – in Iceland worried about earthquakes, the earth’s crust splitting etc. – why did he never focus on the good stuff!! So yes, best not to put ideas in their head, but if they’re already there… well, you can’t go wrong from that point, can you? Might as well learn all the safety systems and drills. What a great idea! We just pretty much look at our globe. Trying to educate about the destination always ends up with our son wanting to know what means we are travelling with (not just an airplane but which airline and what colours does it have. I’m in real trouble. Cars are even worse: oh “why?! ?” don’t I know their marks and what runs with diesel and what with petro?!). My daughter wants to know if she can pack her bag and if she can take her Barbies along. Mostly she will illustrate on paper how many nights we’ll be away and what the weather will be like. So maybe a travel story featuring a Barbie as race car driver/pilot with a magic backpack facing different weather conditions? Your daughter sounds like she’s doing her own version already! Yes, you could definitely work with that, adding drivers/pilots/magic backpacks/etc. Ha well you’ll have to make your own decision on the cake, but Z would be coming up to the right age range for the travel guide, for sure. It has worked well. I’ve even had requests to hear more about Wiggy’s adventures between trips. Have you thought about publishing your books? It would be cool to be published. But the travel guides are too specific for publication – they’re for a particular family for a particular holiday. Plus the story as a whole doesn’t flow like a story (it flows like an unevenly-described travel itinerary 🙂 ) so I think it would mainly appeal to kids who are on/have been on the exact trip in question. Blackforest cake for me, non-fiction for the kids. That’s the way it would go down. I love how you open up dialogue with the kidlets. It does make for less embarassing moments in different cultures. “Mummy what’s that brown man doing?” Why that Indonesian person is setting up his pork crackling shop. I won’t absolutely promise a reduction in awkward conversations like that. Sometimes the more they know the more questions they have… Still. Worth a try? Great idea to go from a sci-fi approach – can mix facts and fun! The kids were unexpectedly taken with it in Japan, weren’t they? Especially P – he was really tickled with the idea of an alien doing the same trip as we were. T is still a bit young to grasp it as well but at least there’s drawing paper and colouring in. I love this! How fun! Makes me wish I had young children again. But perhaps I’ll keep these tips and framework in mind for when I have grandchildren. I want to make sure they’re happy little travelers. This is a perfect Grandma job! Mum and Dad can do the packing and organising and Grandma/Grandad can just slip them a little home-made book for the ride. That last one seems a whole hell of a lot like work. I think I’d rather leave the children at home when I travel. Do they have kennels for that sort of thing? I can’t believe you’re reading blogs when there’s sightseeing out there! At least we know your internet connection is holding up for now. Well I feel priviledged and I won’t expect you to be able to keep up for the whole trip. But it’s good to see you around for now! This is awesome. The kids were asking many questions before we left for our European trip and I had virtually no answers. Poor souls. Pretty much all I could say was that we would have a car and we would always be together and we were going to Europe. I thought it was going to be months of anxiety-driven tantrums, but they’ve been very adaptable. Thank goodness. I bow down to your creativity and organization skills. I usually go with: “We’re going to that place in China they have yaks, mud and sticks” or “In Spain it will be warm and we can eat cheese and jamon.” This is followed by: what do you want to bring to do on the plane? My kids would certainly learn more … Maybe next time my daughter can help me write one for her little brother. Aha! You’re right – that should be the next step. I think P’s a bit young for that one yet, but maybe once he gets to 8+? That’s a really great idea. The time and creativity needed is the biggest issue I have. But I have time before November (maybe). Hopefully I can do this to prep the kids for our India trip. The one I did for Japan was done only two days before the trip so you definitely have time! You really have this traveling gig all sorted out. You can have as much cake as you like! The idea also works for any new activity – it doesn’t have to be foreign travel. You just have to tweak the formula so the alien friend says they want to try activity X instead of going to country X, and you can use the neighbour-kid as the guide. this is a wonderful guideline! can you whip something like this up for travel memoirs? I could use the organization!